Blancanieves/2012/Arcadia Motion Pictures, et al/104 min. Luminously beautiful, compelling and surprisingly moving, “Blancanieves” is a fairytale noir that’s a must-see for lovers of black and white and silent film. Writer/director Pablo Berger’s exquisite rendering of “Snow White” takes place in 1920s Seville and tells the passionate story of Carmen (Macarena García), the daughter of a famous bullfighter (Daniel Giménez Cacho), and her struggle to escape from under the thumb of her evil stepmother Encarna (Maribel Verdú). Carmen has inherited her father’s talent in the ring and, after a near brush with death at the hands of Encarna’s henchman, Carmen, as Blancanieves (Snow White), is rescued and becomes the star of a troupe of seven bullfighting dwarves. But, like any cruel and conniving femme fatale worth her salt, Encarna isn’t that easy to vanquish and she reappears to cause murderous trouble for Carmen. “The film is true to the dark spirit of the popular tale from the Brothers Grimm,” says Berger. “I use melodrama as a way of pushing the limits of characters in extreme situations.” Visually, Berger’s film is a celebration of the work of the masters of silent cinema, such as F.W. Murnau, Jacques Feyder and Victor Sjostrom. Superb music from Alfonso de Vilallonga heightens the mood of edgy enchantment. Whereas the much acclaimed, Oscar-winning and gorgeously shot French b&w silent “The Artist” sometimes seemed slightly pat and overly commercial, Berger’s willingness in “Biancanieves” to take risks results in a poetic, personal work that’s rich in texture, stunning in design and daring in vision. 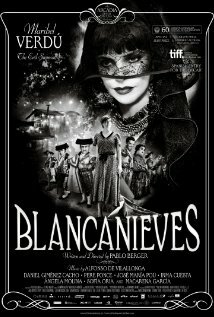 “Blancanieves” opens today in New York and LA with a national roll out to follow. This is a paid post, written by the New York Film Academy. The New York Film Academy is a purveyor of great cinematography of any genre, but faculty staff at the filmmaking school particularly enjoy a good film noir, especially when using it to teach students the nuances of expressionism. Here we unveil seven of the Academy’s favorite film noir flicks. Where possible, we’ve provided links to the full movies. Heist films don’t get any better than this. 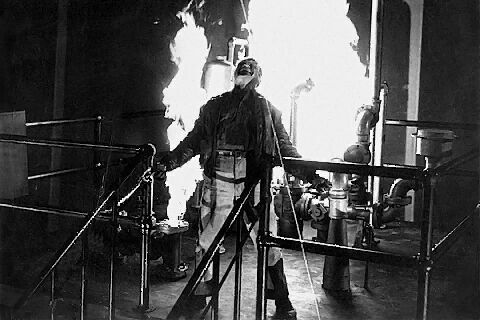 “White Heat” is a precursor to many of the great gangster and prison movies of the ’50s, albeit a lot grittier and a lot darker than the films it went on to inspire. Virginia Mayo is a divine femme fatale, and James Cagney’s performance as psychotic mobster Cody Jarrett is electrifying. 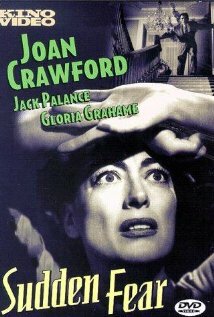 After a string of marvelous hard-boiled flicks with Warner Bros., Joan Crawford left the studio and went on to star in the psychological masterpiece “Sudden Fear.” It’s a great movie and one of the best of Crawford’s ’50s output; it also earned her an Oscar nomination for best actress. Palance received a nod for Best Actor in a supporting role. The film itself rightfully received nominations for best costume design and best cinematography. One of my favorite film festivals starts in a few weeks. 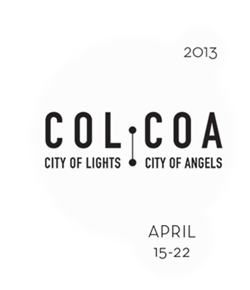 The City of Lights, City of Angels (COL•COA) film festival, a week of premieres in Hollywood, runs April 15-22. Last night, at the French Consulate, the Franco-American Cultural Fund announced the program for the fest, now in its 17th year. “We are proud to offer the biggest and most exclusive program ever, including, for the first time, a new series that highlights the French film industry’s support of world cinema,” said François Truffart, COL•COA executive producer and artistic director. COL•COA will feature 38 features and 19 shorts. It opens on Monday, April 15, with the North American premiere of “It Happened in Saint-Tropez,” a Danièle Thompson comedy, starring Kad Merad and Monica Bellucci. The film will be released in France on April 10. Closing the fest on Sunday, April 22, is the recent French box-office success, “Jappeloup,” directed by Christian Duguay. Of course, I am most looking forward to the film noir series, which will include “Armed Hands,” co-written and directed by Pierre Jolivet. More on the fest later; meanwhile be sure to check the COL•COA site and snag your tickets – they will sell quickly! 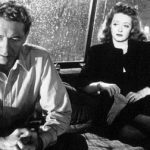 The Noir File is FNB’s guide to classic film noir, neo-noir, sort of noir and pre-noir on cable TV. All movies below are from the schedule of Turner Classic Movies (TCM), which broadcasts them uncut and uninterrupted. The times are Eastern Standard and (Pacific Standard). 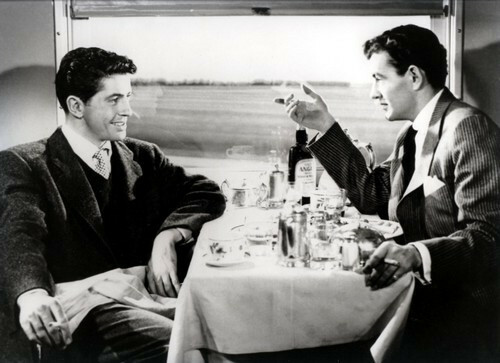 “Strangers on a Train” (1951, Alfred Hitchcock). Tuesday, April 2, 8 p.m. (5 p.m.). 6 a.m. (3 a.m.): “The Asphalt Jungle” (1950, John Huston). With Sterling Hayden, Sam Jaffe and Marilyn Monroe. 12:45 p.m. (9:45 a.m.): “Crime Wave” (1954, Andre De Toth). One of De Toth’s best noirs. In this grim L.A.-shot cops-and-robbers thriller, Gene Nelson plays an ex-con trying to go straight, but stymied by a brutal cop (Sterling Hayden), who wants to nail him for a stick-up and murder committed not by Nelson but by his old prison mates. (The gang, a top-notch crock of crooks, includes Ted De Corsia, Charles Bronson and Timothy Carey). As for Hayden, this is one of his great “heavy” roles. As a cop who won’t give up, while confidently ruining the life of an innocent man, he’s maniacal, terrifying. 7:45 a.m. (4:45 a.m.): “Dead Ringer” (1964, Paul Henreid). Two twin sisters, one obscenely rich, and one financially strapped, have been off each other’s radar for years, ever since bitchy rich Margaret stole bitter not-rich Edith’s wealthy fiancé. Then they meet up at the hubby’s L. A. funeral. Since both sisters are played by Bette Davis, we can expect the same kind of elegant switcheroo (one twin playing another) she pulled in the superior “A Stolen Life” (1946, Curtis Bernhardt), which plays at 11:30 a.m. (8:30 a.m.). 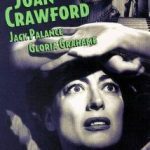 Expect to have some fun, despite the fact, or maybe because of it, that the whole story is so implausible, even William Castle might have ducked it. 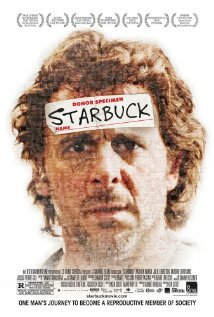 Starbuck/2011/Caramel Films, Les Films Christal, Entertainment One/109 min. Every once in a while, I need a break from the double-dealing dark side and so I indulge in lighter fare. The premise of “Starbuck,” a French-Canadian comedy co-written and directed by Ken Scott, promises an offbeat angle for its humor. Based on real events, it’s the story of a 42-year-old man-boy named David Wosniak (Patrick Huard) who, on the brink of having a child with his girlfriend (Julie Le Breton), discovers that in fact he already has 533 children, thanks to his frequent sperm donations (under the name Starbuck) at a fertility clinic near his home. His offspring are now adults and 142 of them file a class-action lawsuit to determine the identity of their biological father. Huard is an extremely appealing actor and is ideally cast as the good-hearted bumbler; Le Breton and the rest of the cast offer solid support. The problem is that “Starbuck” – primarily due to its clumsy, sometimes forced, script – doesn’t live up to its potential. As the stuff-happens plot unfolds, David’s life becomes slightly more chaotic. But it wasn’t particularly orderly to begin with and, since he’s open to meeting these strangers/children and involving himself in their lives, there’s not a whole lot at stake. Again and again, we see that despite being a little reckless and a lot feckless, he’s a decent guy with a big heart. Nice. And now he’s going to make that 534 kids. Also nice, except that there’s so little dramatic tension, it’s very hard to get swept up in what should be a crazy adventure (but isn’t) and even harder to play the laughs. Despite having the perfect ingredients for a cinematic soufflé, “Starbuck” falls flat. There is a U.S. version in the works called “The Delivery Man,” slated for a fall release, which just might be that rare instance in which a Hollywood remake of a foreign film yields a classic confection.